Electroglass exhibits at leading glass industry exhibitions worldwide, where our senior technical staff are on hand to meet existing customers and to introduce our technology, equipment and latest developments to others. 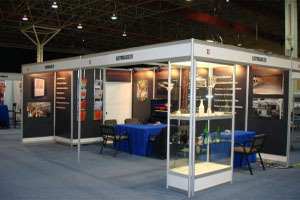 Electroglass personnel also regularly attend and present technical papers at major international glass industry conferences and seminars. Some of the Exhibitions and Conferences we are due to attend soon are shown below. If you are interested to meet us and would like to make an appointment for a particular date or time, please contact us. Orders for the Electroglass Glass Level Sensor continue arriving with a total of 4 system orders in the last week of June by two different customers. This unique system features a static probe unit which requires no on site calibration, has no moving parts and requires no special cooling. This system remains in contact with the glass and therefore indicates real time glass level data accurate to 0.1mm. Two new Digital Precision Control Bubbler Systems are currently under manufacture in our workshops for countries in the Far East. Both systems are repeat orders from existing Electroglass Bubbler System customers for new furnace projects. Over 50 % of the bubbler systems we have supplied have been repeat orders, - clearly showing a high level of satisfaction with this technology. Electroglass engineers have recently returned from the successful commissioning of a new 30 tonnes/day all-electric furnace and forehearth system for a new customer in Bangladesh. Operating at under our predicted energy consumption of 790kwhr/tonne and producing good saleable quality fluoride opal glass within a few days of commissioning this furnace will provide our customer with the high quality, energy efficient production required for this new tableware venture. We are currently undertaking a project to increase the furnace capacity and add additional forehearths for an Electroglass All-Electric furnace producing fluoride opal glass for a long standing customer. In the 20+ years since its introduction and with systems installed in 28 countries the Electroglass Precision Control Bubbler System (PCBS) has proved popular with manufacturers of various glass types that are looking for a better alternative to continuous, uncontrolled bubbling. From the first generation systems with electro-mechanical control to the current range of PLC controlled systems, the PCBS has evolved to meet the needs of the modern glass factory. Following recent further development work we are pleased to launch the Digital PCBS control system. Understanding the need for operational accountability this new control system sees the replacement of all analogue pressure metering with digital transducers which can be monitored from two separate HMI displays; one local to the furnace, the other within the furnace control room. Limited trending and history logging of parameter changes to allow operators and supervisors to track operational variations and simplified integration options allow operation to be monitored by a wider audience across the factory network. The new Digital Precision Control Bubbler is available now as either a complete new system or as an upgrade to existing systems already in operation. Sales of the Electroglass range of water cooled electrode holders continue to grow, with many hundreds manufactured each year. This has included recent orders for over 180 for one established customer alone. All of our electrode holders are manufactured in-house by our own skilled and experienced technicians. Recent feedback from one long standing customer has confirmed electrode holder operating lives have now exceeded 14 years in container glass and are expected to continue to operate for a further 2 years before replacement at full cold furnace repair. An electrode holder ;life of 16 years without repair or replacement is a major advantage to the glass manufacturer and is testament to our design, exacting build and strict quality control. Sales of Electroglass dry-type electrodes remain particularly strong. Typically used in immersed electrode heating systems in distributor channels and forehearths, many customers are choosing Electroglass’ electrodes to replace other designs. Key to this success are features designed to prevent bubble generation and molybdenum oxidation problems associated with other types of forehearth electrodes. Electroglass dry-type electrodes are manufactured to order in our own workshops and are available in various lengths and diameters to suit the requirements of each application. Well-documented case histories show that Electroglass Electroflex All-Electric forehearths can provide substantial operating cost savings compared with gas forehearths and even other designs of all-electric forehearth. With actual cases of operating cost savings of more than 75% from converting existing gas forehearths to Electroglass all-electric, more and more glass manufacturers are evaluating similar conversions. Three further such forehearth conversions will soon be commissioned for a long standing Electroglass customer in the Far East, replacing gas fired forehearths, but maintaining existing casings and gob drop points. Other gas-to-electric forehearth conversion projects are following, including a first order just received from a major container glass manufacturer in Thailand, for a 20ft Electroflex All-Electric Forehearth to be installed at a forthcoming furnace repair. Replacing an existing gas heated system, the Electroglass all-electric forehearth will re-use the existing casing and will maintain the existing gob drop points whilst offering an operating cost saving of well over 70%.